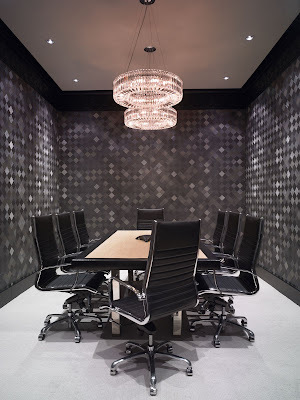 How gorgeous and glamorous are the offices for Randall Davis? Randall Davis is a real estate development company specializing in upscale condominiums in Houston. By the looks of it, this company understands the importance image plays in real estate, as well as in most other industries. The mood of the space as a whole is kind of dark and moody, yet fun and very stylish. The Hollywood look is alluring and intriguing. It makes me want to know more about the company and most likely makes prospective clients want in on a piece of the lifestyle they are selling. Me? I want the adorable office in the last picture. Everything about this place is FAB! What amazing windows! 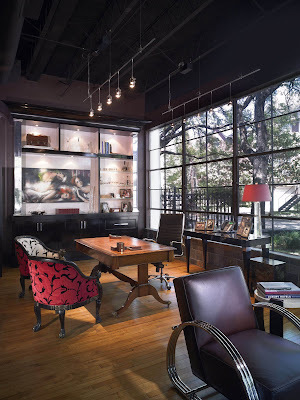 Absolutely gorgeous office space. I want their interior designer to do my house! Thanks for sharing this absolutely stunning office! There is nothing we don't love about this. I love that last picture, I would look forward to coming to work if I had that office!